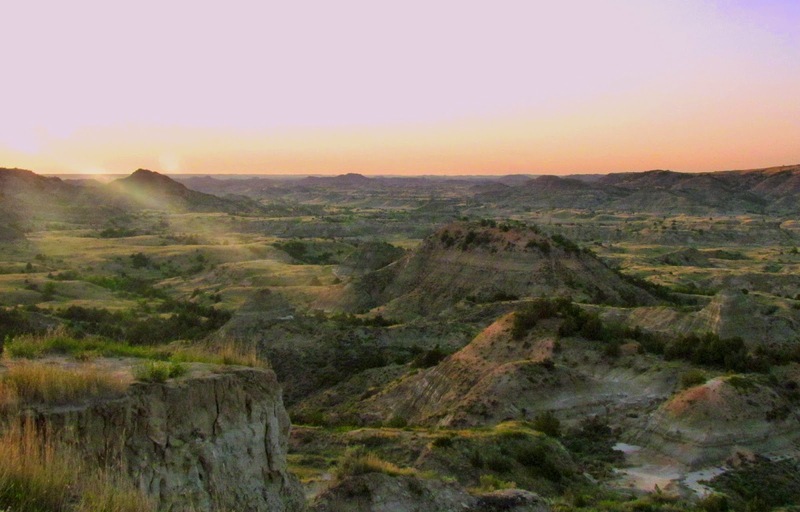 North Dakota's badlands couldn't be in a better spot. (Well, they'd be better off without all that oil shale under them, but that's another story.) The badlands fall pretty much on a line the separates the western from eastern avifauna of North America. More specifically, it's the border between the upper Great Plains and the Rocky Mountain ecoregions. Any time you're birding around a "borderland" like that, it's bound to be interesting. Yes, it actually looks like this. Painted Canyon, Theodore Roosevelt NP. 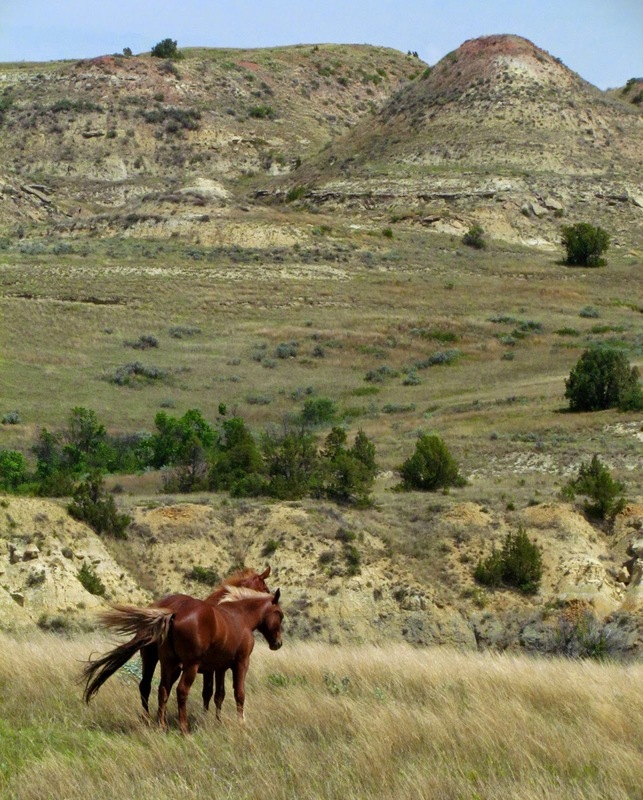 The only truly protected areas of the badlands of any considerable size are the two units of Theodore Roosevelt National Park. The South Unit is right off of I-94 with the town of Medora serving as gateway. The North Unit is a bit more remote, but no less scenic. 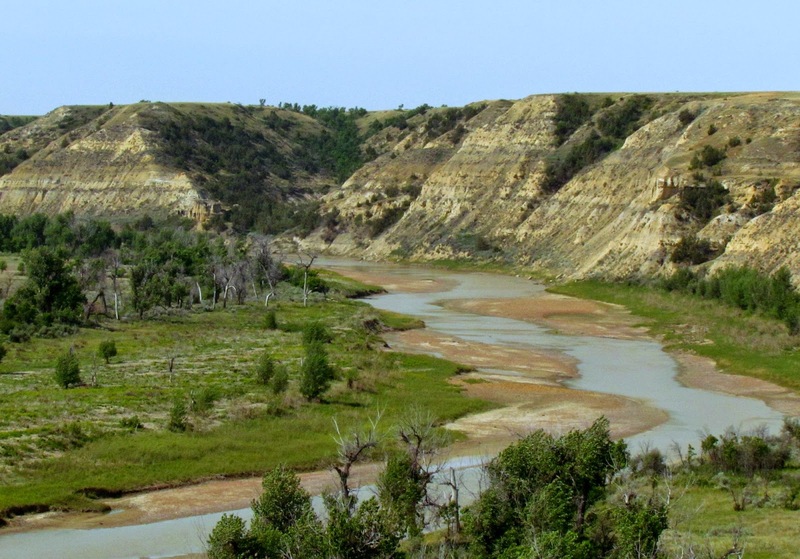 The park has plenty of rocky scrubland, grassland, and riparian habitat with the Little Missouri River winding its way through the wilderness. Spotted Towhees provide the background soundtrack for the park while Lark Sparrows are the real "trashbird." 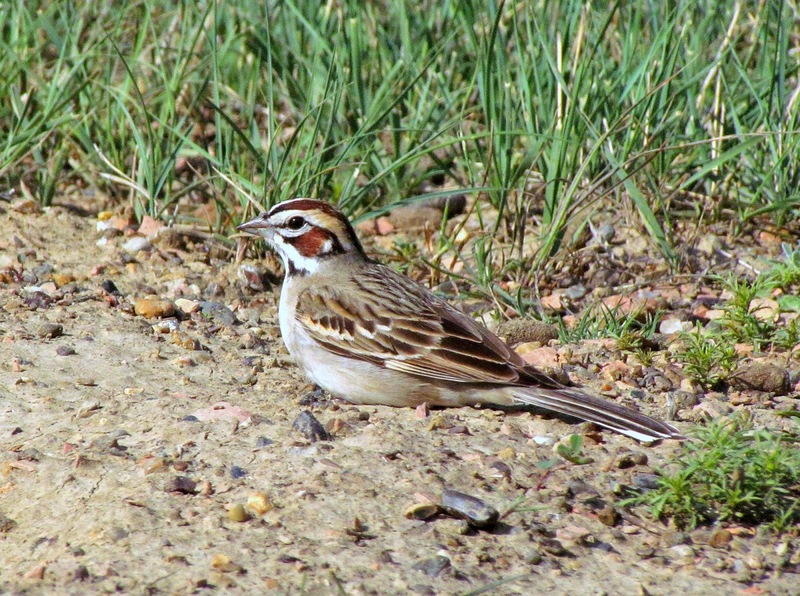 When something as cool as a Lark Sparrow is your trashbird, you know you're in a good spot! 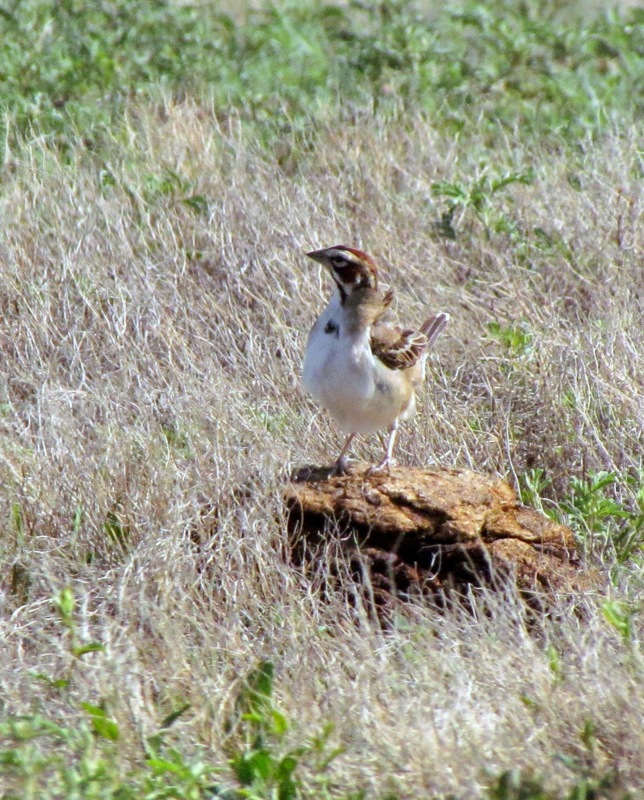 Lark Sparrow (Chondestes grammacus. They are EVERYWHERE in Teddy Roosevelt. 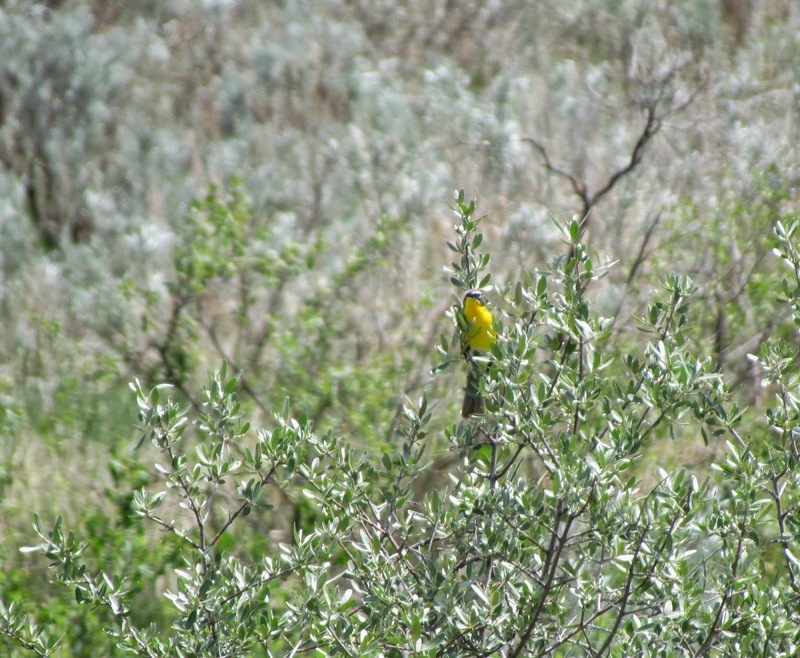 Western Kingbird (Tyrannus verticalis) in the North Unit. Birds aren't the only animals worth looking at in the park. Bison and pronghorn are easy to spot. Easy, that is, unless you're looking up and trying to locate a singing Yellow-breasted Chat while walking around the edge of a small copse of trees. In that case you may startle a reclining bull bison. This will be extremely shocking to both you and the Bison. Ideally the bison will snort, retreat, and merely glare at you rather than charge at you. This will allow you to live long enough to recount the story in a post about Theodore Roosevelt NP at the Birding is Fun blog. This is him glaring at me after he gave me some room. I deeply appreciate his decision to not punish my stupidity. 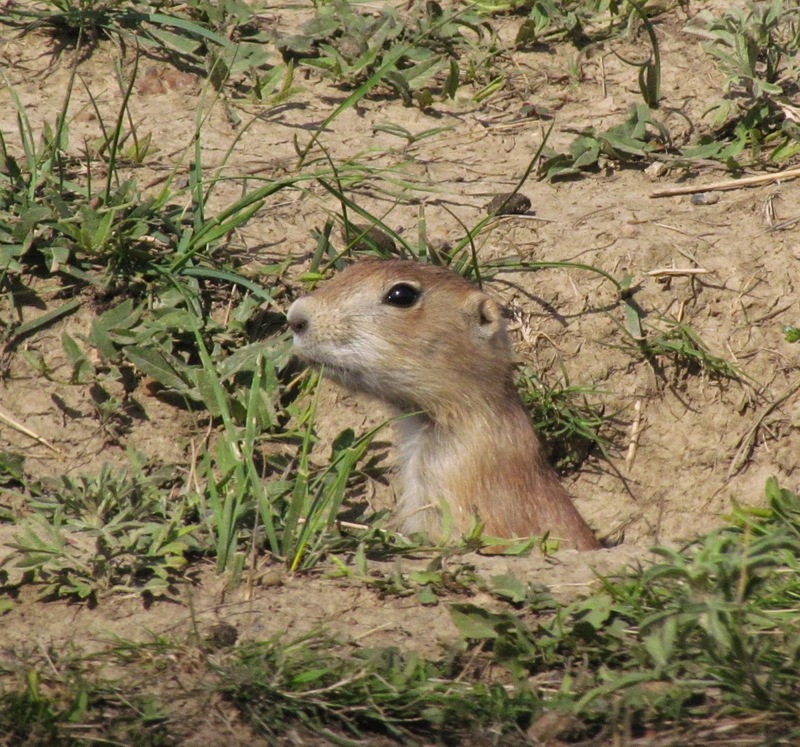 There are several active Prairie Dog towns in the park, providing endless entertainment. If you're watching a town and suddenly every single Prairie Dog gives an alarm cry and disappears into the ground...look up. There's likely a Golden Eagle about to swoop over your head. Pretty cute for not being a bird. 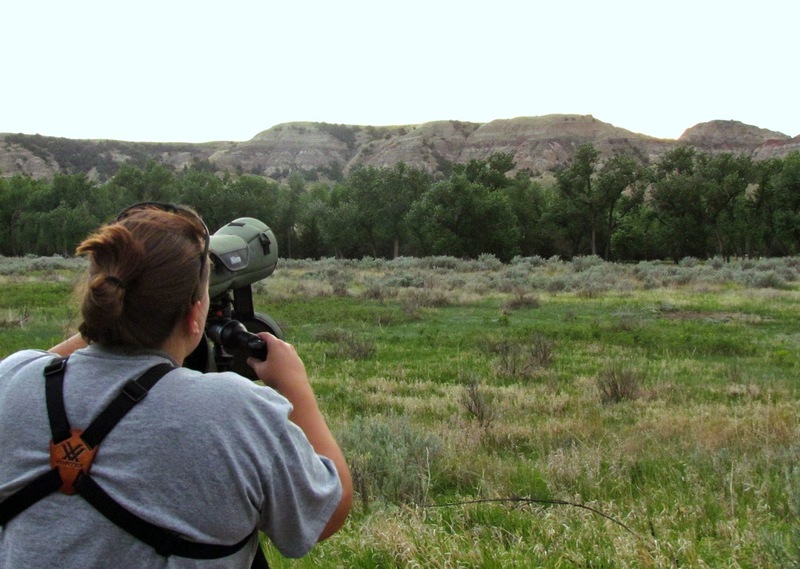 Sarah scoping the bluffs above the Cottonwood Campground for eagles. Golden Eagles nest on those highest cliffs. Did I mention the wild horses? 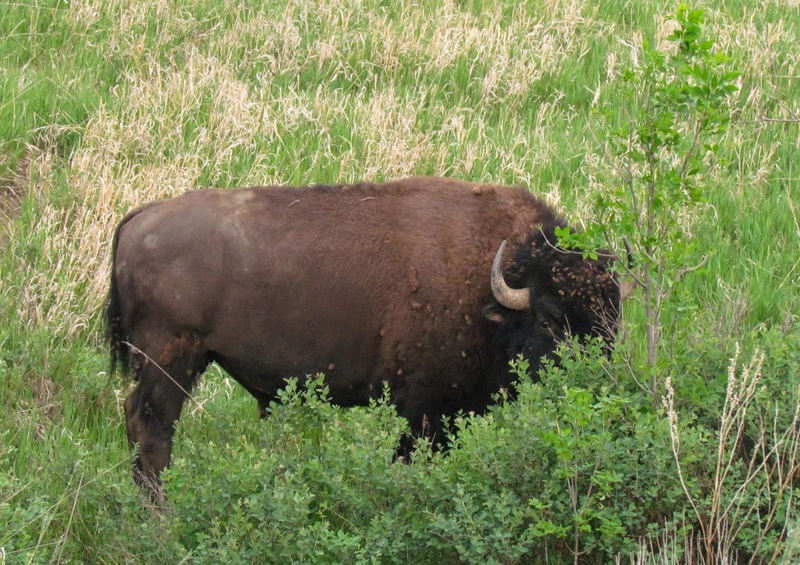 To get a better view in the grassland, simply hop atop some bison dung. 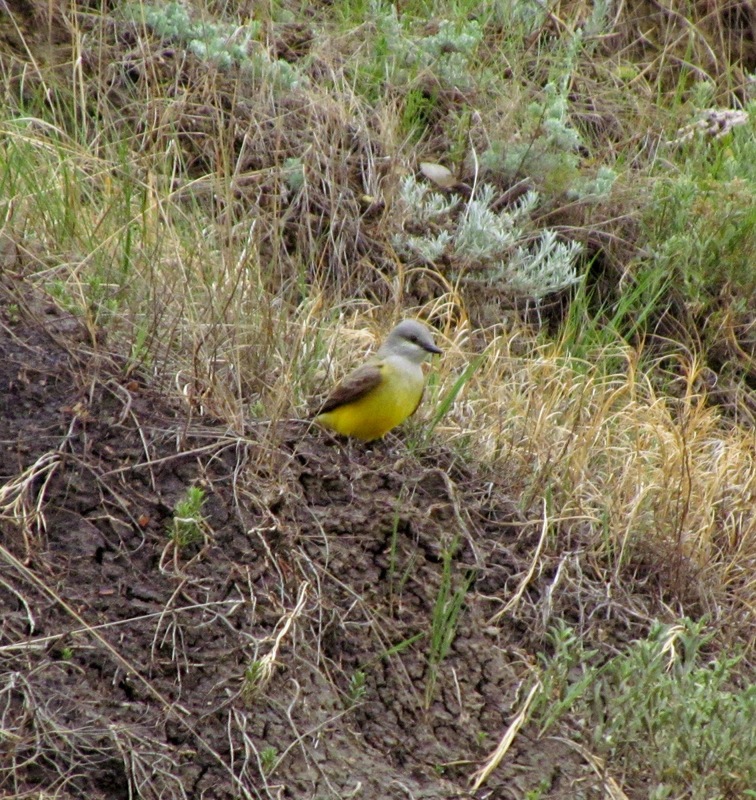 Not a great photo, but this is the Yellow-breasted Chat that almost got me killed, so he deserves a spot here. The Little Missouri River provides an excellent riparian oasis. Birding is fun anywhere you do it. I mean, we all love sewage ponds, don't we? But when you find good birds in a breathtaking natural area it's extra special. Here's a video I shot of a Lazuli Bunting. I think this captures the feel of the place. Watch it till the end, it's short. Sunset at Painted Canyon. I can hear the Spotted Towhees serenading the last light of day. It looks like an interesting place to visit. I'd thank the bison too if I'd been you! Birding is indeed fun when you are taking in birds and breath taking beauty. Nice. Kirby, I have been here and I just love this place! I went before there was eBird, so I would love to go back now. It is a hidden gem! Nice photos and story! Love the singing lazuli!